After a month of tense negotiations and with one day to go until the Sept. 30th deadline, the US and Canada are poised to announce a deal on Nafta in the last minute, ending the impasse that has jeopardized $500 billion in annual trade between the two North American neighbors, Bloomberg reports citing people familiar with the talks. The reason for the scramble - which also includes a "heavily involved" Justin Trudeau as well as Jared Kushner - to announce a deal by Sunday is so that it can be signed by Mexican President Enrique Pena Nieto before he leaves office, one month after the U.S. and Mexico reached their own bilateral agreement, triggering talks between the U.S. and Canada, which are being held around the clock this weekend. Under U.S. trade law, an agreement must be published for 60 days before it can be signed by leaders of any of the participant countries, putting negotiators on the clock to reach a deal that can be signed by Nov. 30, Pena Nieto’s final day in office. So who "bent the knee?" While the final document has yet to be published, the Globe and Mail reports that the Trump administration was ready to concede to Canada’s wish to keep Chapter 19′s dispute-settlement mechanism in place in exchange for greater access for U.S. dairy products. Canada is prepared to allow U.S. dairy into Canada at rates that are higher than the 3.2 per cent under the eleven country Trans-Pacific partnership, sources said. Ottawa also made concessions on section 7, which is part of the country’s milk classification system that is used to set prices for skim milk, whole milk powder and protein concentrates. Canada was also ready to agree to the same arrangement as Mexico to raise its duty-free limit to $100, according to a source. Canada’s duty free is currently $20. A senior Canadian official involved in the talks said there is no final written sign-off on Chapter 19 or dairy access but the insider said the two sides are close to a deal. The talks had taken on a frenetic pace over the last 24 hours with Jared Kushner, the son-in-law of President Donald Trump, pushing for a deal before Sunday’s deadline to start a 60-day countdown to a final revamped pact being signed by the end of November. While the two sides held off a plan to public the legal text of the agreement on Friday, the U.S. and Canada, which is the main export partner for the vast majority of US states, have reportedly solved, or made progress on the major outstanding issues, with sources saying that "at this stage no issue seems too large to overcome." 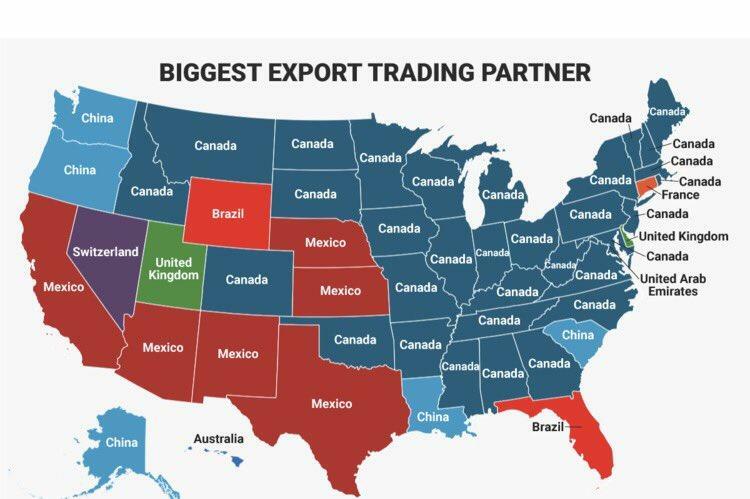 "Most of the big issues are solved with Canada", Trump trade adviser Peter Navarro said Saturday in an interview with Fox News. "It’s a great deal for all three countries in that it would make this hemisphere strong again from a manufacturing point of view." Meanwhile, at least one Canadian government official familiar with the talks, poured some cold water on the rising enthusiasm and said the nations had been at this stage before, and that nothing is final. Specifically, Canada’s demands for protection from U.S. tariff measures is one of the last sticking points in negotiations. Of the above, The globe reports that the key item is U.S. negotiators’ unwillingness to remove 25% tariffs imposed on Canadian steel and aluminum. A failure to real a deal in the next 24 hours could also jeopardize the already concluded deal between the US and Mexico, as any bilateral deal without Canada would face delays in Congress, where key lawmakers have called for the three-nation format to continue. Meanwhile, the existing Nafta remains in effect, and any country can quit on six months’ notice; no country has given such notice. Ultimately, the failure to reach a deal raises the prospect of what some call a zombie Nafta - a bilateral deal advancing to update a trilateral pact, even while the old agreement remains in place. A former senior Canadian trade adviser warned that the auto tariff threat, which would be "devastating" to the Canadian economy, outweighs anything else. Trump has repeatedly threatened to slap Canada with auto tariffs if Ottawa refuses to negotiate. If a Nafta deal is reached, the U.S. government would see little reason to impose auto tariffs on Canada, but it was unclear whether there would be any hard exemption granted. Of course, if over the next 24 hours a deal is announced, all of the above would be moot and Trump's unorthodox negotiating style will have successfully resolved yet another major trade milestone. The globe reports that there are tentative plans for Trudeau and Foreign Affairs Minister Chrystia Freeland to hold a news conference announcing a deal either Sunday night or Monday morning if there is a successful conclusion, but an "insider" cautioned the talks are still ongoing and Kushner and Robert Lighthizer still have to get sign off from President Trump; that in itself, can be "problematic."